For many years, baseball groundskeepers have leveled the playing field through old-fashioned mechanical means—with the dual purpose of guaranteeing “good hops” for infielders and allowing for effective water drainage after a rainfall. While experienced groundskeepers do wonders with the creation of proper slopes, it’s a slow, labor-intensive task that is not always practical. 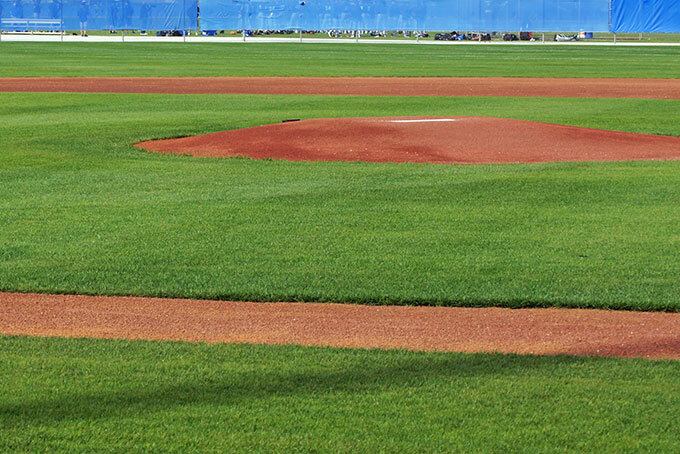 We are the only athletic field landscaper in the area that offers laser grading—a fast, modern and highly accurate method of restoring and preserving the integrity of baseball diamonds. Laser grading guarantees that water will flow off the surface of the soil during a rainstorm. In fact, our laser grading clients have told us that their fields are playable even after heavy rains, while fields elsewhere are too waterlogged to use. It’s important to note that annual maintenance (laser topdressing) is needed to reestablish the proper grade of your baseball field. Laser grading smooths materials and surfaces to a desired slope via a machine-controlled leveling blade. A laser transmitter, mounted on a tripod, emits a thin beam of light that rotates 360 degrees. This creates a grade reference over the work area. A laser receiver—mounted on a mast attached to the leveling blade—detects the laser beam’s elevation and sends the information to an onboard computer. The computer sends signals to a hydraulic valve, which controls the lift cylinders of the blade. The valve raises or lowers the machine’s cutting edge according to the signals, thereby maintaining correct elevation. Are you interested in utilizing an advanced system like our laser grading service for your ball field? Click here or call (203) 628-4377 to contact the experts at Diamond Landscapes & Athletic Fields today.